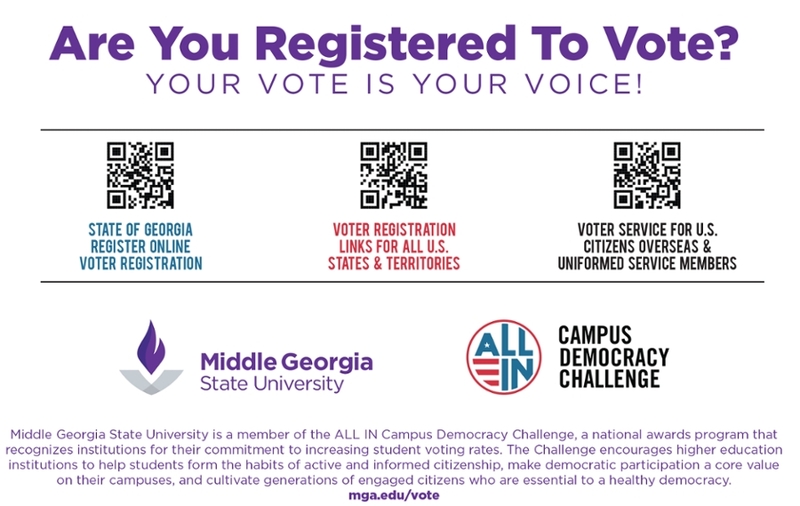 Middle Georgia State University is a member of the ALL IN Campus Democracy Challenge, a national awards program that recognizes institutions for their commitment to increasing student voting rates. The Challenge encourages higher education institutions to help students form the habits of active and informed citizenship, make democratic participation a core value on their campus, and cultivate generations of engaged citizens who are essential to a healthy democracy. Throughout the year, the ALL IN Campus Democracy Challenge and various Recognized Student Organizations sponsor voter registration events on MGA campuses.